1 The British Columbia Provincial Museum recently came into possession of the original patent papers and two photographs of a chain saw which is possibly the first developed in Canada.1 James Shand, millwright and farmer in Dauphin, Manitoba, patented his "endless" chain saw in 1918. The idea came to him while he was fencing his quarter-section of land and discovered that the barbed wire, drawn by horses, had sawn through a seven-inch oak post.2 Working in his shop and using his son's bicycle chain with cutting teeth inserted, Shand produced two working models.3 Shand used one saw for a short time while in the employ of Manitoba Bridge and Iron Works4 and in 1919 he took both working models to British Columbia, hoping to spark interest in chain saw production. 2 Although the models were small with perhaps a 24" blade (small for west coast timber), Shand did grapple with the problem which had previously thwarted chain saw development — a relatively lightweight source of power. He used a small gasoline motor, commonly called a "one-lunger", which transmitted power to the chain through a Bowden cable. Progressive as the machine was, the industry showed no interest in its production, and after a second 6-year term for the patent, Shand allowed his rights to lapse in 1930. 3 The idea of a chain saw was not new. Inventive minds had been at work since 1858 when Harvey Brown of New York City patented his "endless section sawing mechanism", the first device to utilise moving saw bits on a guide bar Further inventions followed during the 19th and early 20th centuries hut none was easily portable as they were powered by large gasoline or steam engines.5 What was to become the final event in the mechanization of the woods was surprisingly slow to develop. James Shand with one of his working models c. 1918. 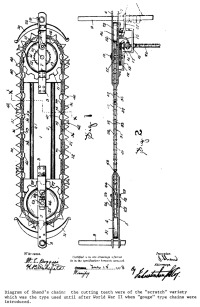 Diagram of Shand's chain: cutting teeth were of the "scratch" variety which was the type used until after World War II when the "gouge" type chains were introduced. 4 The answer to a practical chain saw was one in which the gasoline engine was a light yet integral part of the chain saw. In 1929 the Reed-Prentice Corporation of Worcester, Mass., began development and by 1939 had produced 10 models which were far too heavy as they were powered by cumbersome 4-cycle engines.6 As the Depression wore on, the lead in the field was taken by a German industrialist, Andreas Stihl, whose headquarters were in Stuttgart. He produced for use by the German Army a much improved, light and powerful, 2-cycle motor which overcame the problem of so many early gasoline motors — high weight to horsepower ratio. 5 1936 was the pivotal point in the development of chain saws in British Columbia. The logging industry was recovering from the restrictions of he Depression but per man fallage rates were dropping as loggers, depleting easily accessible big timber stands, were forced to cut smaller trees on more rugged terrain. At the same time logging companies were having increasing difficulty finding workers willing to use the traditional cross-cut saw at a time when other sectors of the industry had become mechanized. This situation was especially critical with companies like Bloedel, Stewart and Welch which had to import the more sophisticated labour of metropolitan areas to work their isolated logging operations; these men were less willing to use hand-falling methods than were their rural counterparts.7 The time was propitious for experiments with new techniques and new equipment. 6 The potential of the power saw in the woods was becoming known in 1936. Progress had been made in the California redwoods with large gasoline-driven drag saws. However, this development was not suitable for British Columbia. A California logger would be content to haul this large machine through the redwoods when he had to cut only one or two trees a day; but in British Columbia up to forty or fifty trees had to be felled to achieve the same economy in terms of board feet dropped. 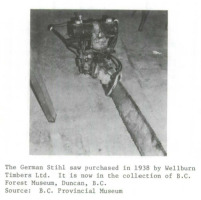 The German Stihl saw purchased in 1938 by Wellburn Timbers Ltd. It is now in the collection of B.C. Forest Museum, Duncan, B.C. 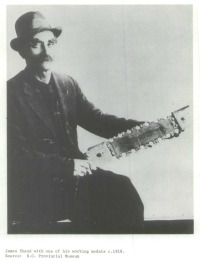 Jack Vaux, filer and faller for Wellburn Timbers Ltd. in 1940 with "Timberhog". Source: Mr. Gerry Wellburn, Victoria, B.C. 10 Despite its trials and tribulations the chain saw had proved its worth by 1939. 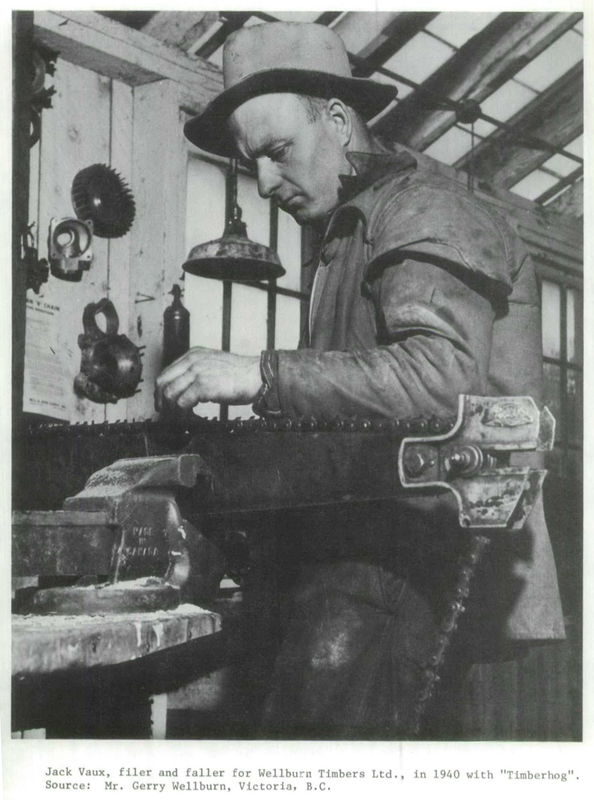 Production figures for power saw fallage in one company went from 6 million board feet in 1937 to 100 million in 1939.15 Just as demand was growing for the new saws, however, the outbreak of World War II cut off Canadian customers from Stihl, the main source for components and units. As a result a number of Vancouver-based industries sprang up. 13 Because of the 120-pound weight of the two-man saws, Bloedel, Steward & Welch insisted all prospective power saw operators be over 5'10" and 175 pounds.23 But smaller companies tended to hire any man who could handle the saw. The noise or the machine led to a new appreciation of safety in the woods. The operators could not hear warning shouts or falling limbs so it became mandatory after June 1941 for all power saw crews to wear hard hats.24 It was some time before other workers in the forest industry were similarly protected. 14 Despite the draw-backs of the power saw the operator who was on contract could make better wages than the hand-faller as his production was normally upped by one-third. And the saw's value was especially evident when the men had to cut a pitchy tree; the chain saw easily went through whereas the cross-cut saw would almost certainly bind. Overall the loggers were enthusiastic about power saws They were working "harder to make life easier" as one of them said; the cross-cut saw was a thing of the past and the chain saw would become the highly efficient falling machine of the future. I.E.L. "Beaver", 1946, one of the first of the new one-man saws which facilitated the job of the faller. From the collection of B.C. Provincial Museum. 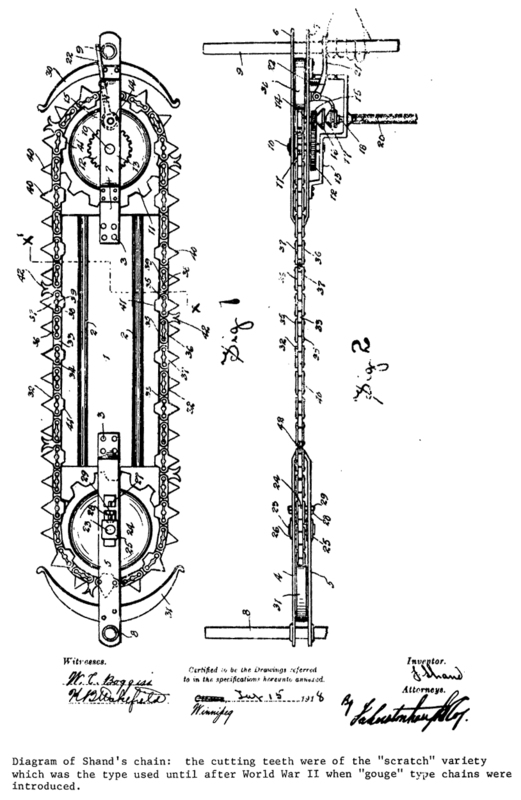 1 A chain saw operates "on the principle of an endless, roller-type chain equipped with cutting teeth and set to move around the edge of a grooved steel blade". "Power Saws in the Wood"s, Timber of Canada, (September, 1954): 34. 2 Vancouver Province, 18 March 1939, Magazine Section, p.2, "Kelowna Millwright Invented Power Saw". 3 Interview with David Shand, 2 June 1976, Victoria, B.C. 4 Vancouver Province, op. cit. 7 This problem was compounded in 1939 when the outbreak of war prevented immigration from Europe, traditionally a reliable source of hand-fallers. 8 Dana Bailey, "Use of Power Saws at Stirling City", British Columbia Lumberman, (November, 1936): 60. 9 Victoria Colonist, 20 October 1936, p.6. "Power Saw to be Tried Here". 10 J.W. 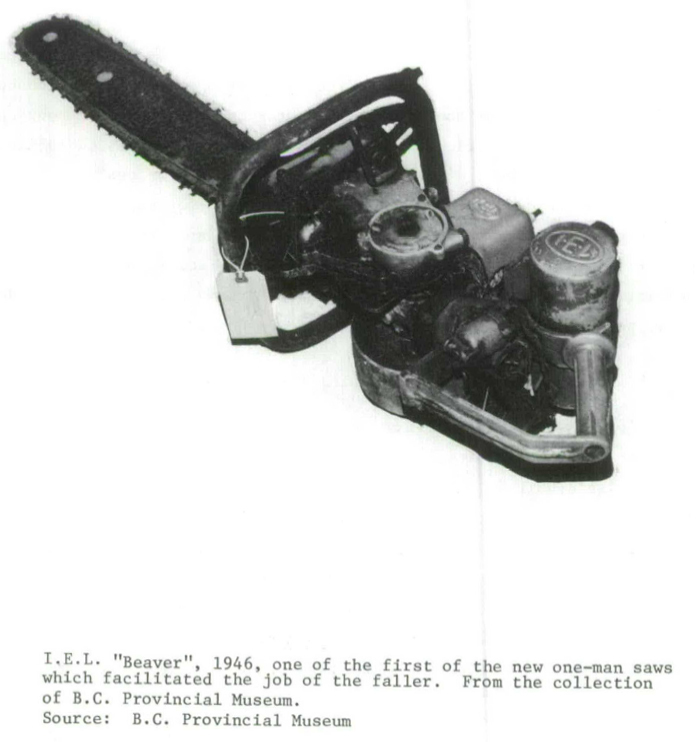 Challenger, "Power Saw Performance Analysed", British Columbia Lumberman, (February, 1941): 29. 11 "The 28th Pacific Logging Congress", British Columbia Lumberman, (October, 1937): 61. 12 Letter from D.J. Smith Equipment Company to Wellburn Timbers Ltd., 9 December, 1938, British Columbia Forest Museum Archives, Duncan, B.C. 13 The electronic model was light and more powerful but it required a generator and a heavy, thick cable which had to be transported through the woods. However, Wellburn Timbers Ltd. did install an electronic Stihl "Timberhog" on their mill deck. Interview with G.E. Wellburn, 8 September 1976, Duncan, B.C. 14 Interview with Evan "Stormy" Burnett, 11 August 1976, Vancouver, B.C. 15 J.W. Challenger, ibid., p.28. 17 "Vancouver Interests Accuire Reed-Prentice Business", British Columbia Lumberman, (May, 1943): 86. 18 Letter from Wellburn Timbers Ltd. to Spear & Jackson (B.C.) Ltd., 23 February 1943. British Columbia Forest Museum Archives, Duncan, B.C. 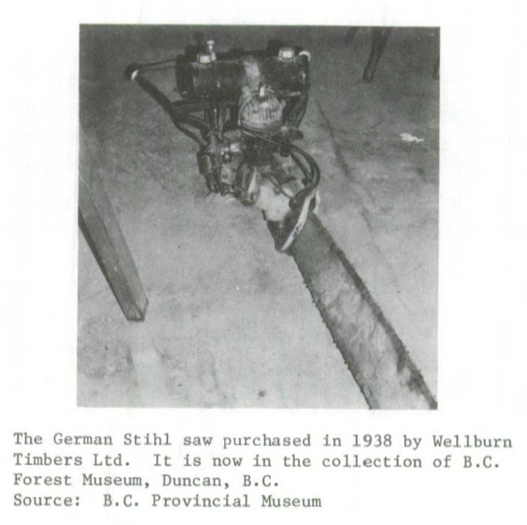 19 By October Bloedel, Steward & Welch could report that 80% of timber felled in 1940 had been by a power saw. Challenger, ibid., p.29. 20 Interview with Stanley Baines, 8 September 1976, Duncan, B.C. 21 Letter from Wellburn Timbers Ltd. Reed-Prentice, Wellburn had returned a 48 chain to the manufacturers because "the fallers point out that the chain is put together with different sized rivets and will not hold up". British Columbia Forest Museum Archives, Duncan, B.C. 22 Interview with Jack Vaux, September 1976, Duncan, B.C. 23 Challenger, ibid., p. 30. 24 "Hard Hats Made Compulsory For Power Saw Crews", British Columbia Lumberman, (June, 1941): 32.